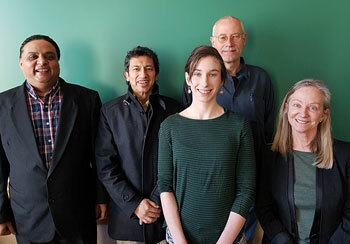 Ms. Natalie Bartmes, MAIG student successfully defended her thesis titled, “Re-Envisioning Land-Based Pedagogies as Transformative Third Space” on January 17, 2018. Natalie’s thesis is based on empirical case study research and examines experiences at the University of Winnipeg in facilitating land-based pedagogical (LBP) courses in First Nations communities in Manitoba, with the goals of strengthening students’ connection with the land and with Indigenous ways of knowing. The research findings suggest that learning on the land and from IK holders/elders can encourage an increased appreciation for the coherence of Indigenous knowledges (IK), an enhanced sense of environmental stewardship, and critical reflection on one’s role as an ally in a reconciliatory relationship with First Nations communities. However, integrating these components as foundational to curriculum can be challenging at the post-secondary level. To address these challenges, research participants presented recommendations ranging from relational, administrative and logistical actions to institution-wide collaboration and mentorship. Natalie was also selected by the UW President’s office to present her research at the UNIVATION, Canada at the conference on ““Universities innovating to prepare students for a disrupted world” at the National Arts Centre, Ottawa.